Marathon #2 - MDI Marathon - is just under 18 weeks away, which for me, means Marathon Training has begun! Good thing I only have 2.5 more days of school and then I'm officially in summer mode. I won't be taking the entire summer off from school. I will be teaching summer school (part time) and I will be preparing myself for my new program in my new classroom. Not to mention, I'll be spending tons of time with the family at the beach, cottage, parks and other fun adventures. Back to the marathon training. I've decided that I'm going to follow a modified version Train Like a Mother's Own It Marathon Plan. Have you had the chance to read TLAM? If you haven't, you have to get it. I love Dimity and Sarah's humor throughout the entire book. Why can't I just make it easy and simply follow a plan? That wouldn't be me, now would it? You see, I have this summer full of races I want to do. I just don't want to just do them either. I want to do my best. I know my body and I know I need to give myself some easier days prior to a race and I need to give my body some rest time...which means switching things up a bit. I will follow this plan as closely as possible. I am also coordinating with the girls and their long runs as they are gearing up for their 1st marathon at the Maine Marathon on September 30th! My plan is to continue to do my long runs with them and then add on mileage when I need to. Then on their big marathon day, I'm hoping to bike the route and be their support girl. & there may be a Wilton Blueberry Festival 10k in the mix as well and the Old Hallowell Day 5K...Oh I know I could keep adding to the list so easily right now!!! But I won't. I need to limit myself because I found out last summer that these races do throw off marathon training. So, welcome to Jen's marathon training, which officially begins today. Well, I guess it doesn't really start today because today's a rest day. I guess it starts tomorrow with a 6 mile tempo run. What marathon plans do you use? or do you just make up your own plan? Smart plan, Tara!!!! Will you be doing the Bond Brook 5k series with Amy as well. I know she did it last year. Good luck!! I did the Maine Marathon a few years ago, and absolutely loved it! Would definitely do it again. Relatively flat, cool, and so scenic! Yes, Maine Marathon is a great 1st marathon - actually it's a great marathon in general. I loved it. I know my girls are going to enjoy it as well. Thanks for coming over to my blog! Good luck, I am starting my marathon training in a couple of weeks! I just ordered this book, hoping to use one of the plans! I am positive you are going to love TLAM! & yay for you starting your marathon training too! I love Sarah and Dimity, too! I read RLAM and got to have dinner with them when they were in Houston, need to get a copy of TLAM soon!! I'm hoping to BQ at my next marathon too... you've got the determination, I'm sure you can get there with hard work! And it's wise to not put that expectation on for this particular race, but that doesn't mean you don't give it your best shot... yay for training beginning! You are incredibly lucky to have met them & yes, you need to get the book! I am pretty sure I won't BQ at MDI. That's definitely a long term goal....but I'm sure going to work hard at improving my time! You are definitely going to own it! Some day I will! Thanks, Amy! Wahoo! Good luck, girl! I'm doing a modified version of Run Less Run Faster for Steamtown. It worked well for me for my last race so hopefully it will work well again. :) Can't wait to follow your training! And let's find a race to do in August!! RLRF must be a great plan if you're doing it for a 2nd time!!! Glad to see that you modify your plans as well. I'm sure most of us do. :) & yes - running in August. But not that clothing optional one, okay? We're still firming up the dates we'll be down! IM STILL CONSIDERING PONDERING SOMEDAY'ING NUMBER ONE!! You should - at least do one and cross of your list! you will do great. woo hoo for training around the same time! oh, and I think i'm going to buy that book. Oh you need to buy the book for sure! It's funny and makes total sense. Life gets in the way for sure!!! & you already own it dear!! !I want to be as speedy as you! ONE day I would love to be able to run a marathon ... So far sticking with 1/2s. I feel like I need to be mentally ready to commit and I'm not quite there yet haha. It's definitely a mental commitment for sure. I'm thinking I am mental for wanting to run more and even more mental for thinking that someday I can hopefully BQ. I do love the half marathon length the most!! Oh, thanks, girl!!! What half are you doing??? Awesome! I start training for my first full marathon in August - scary, yet exciting! Can't wait to watch your training as well! So awesome!!! It is scary but very exciting. Yay your 1st! I know better than to expect to BQ at mdi for sure!!! I'm looking forward to running it and taking in the beauty! I love Sarah and Dimiti! I haven't had a chance to read their books yet but I love running and listening to their podcasts. They keep me smiling through the miles! I do love their podcasts as well. They are a huge hit with me. Some day, some day!!! :) Thanks! GOOD LUCK JEN! 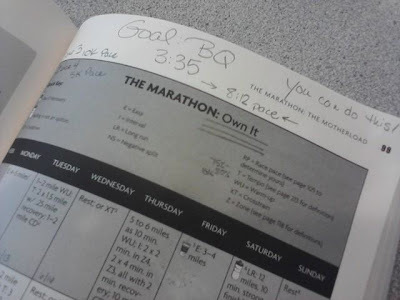 I definitely think you can BQ! I am training for my first marathon, so I will be excited to follow along during your training and check out what tactics you are using. Can't wait to see you rock it! Oh, I sure hope so!!!! But not the MDI one. Can't wait to follow your marathon training too!!! I just decided that I was going to run my first marathon this upcoming November. I was already training for a half that I ended up not running because of personal reasons, so I just decided to keep up with my training and go for a full! I'm nervous but so excited! You're half way there...maybe as well keep going for the full!!! Best of luck to you! I'm trying to keep the schedule light. I could easily fill it with tons of little races - but I need to keep my eye on the big picture. You don't have to be a mommy to read the book....there are some mommy insider jokes but overall it's a great read for any woman runner. Lucky you being a run coach! Love that you are getting yourself pumped! You can do it, you can train for it... you can own it. I always have a goal in mind and train towards it. My schedule is never set in stone, it's like water, keep it fluid. But that is advice from a running veteran. Trust in your training and listen to you body. Great combo! Yes - the plan has to be fluid. If I'm too rigid about it, I'll just drive myself crazy and everyone else! Good luck with your training! I like to make my own training plans because, like you, I always have a bunch of little races I want to throw in there! I'm a race junkie...it is NOT GOOD for my bank account! Can't wait to read about your training! I get what you mean about not being good for the bank account. Ward actually told me that we should set a race budget because are both soooo bad about racing too much! Good luck with your training and your marathon! I am looking for a good training plan but tend to change it up to meet my busy schedule! I've already done some swapping in the schedule today! Crazy! Gotta fit in the running in our crazy filled lives! Oh I am sooooo excited for you :) that's amazing!!!!!!! 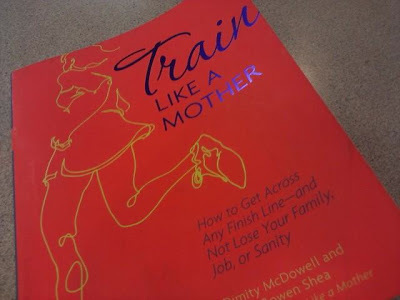 and I want to read train like a mother so bad! haha dont you just love how day 1 is a rest day? that drives me NUTS!! now that i am three days into week 12 (holy crap!) of my marathon training, i can honestly say i have loved this plan im using (pfitzinger advanced marathoning). ive tried it before but a lot of life got in the way... this time around i have been focused and really put everything i have into it. sure, i have given myself a break if/when i needed it, but overall i am feeling strong and confident. you absolutely can take a LOT of time off your first marathon time, just trust yourself. MDI is gorgeous and challenging but absolutely a great course to run fast and strong. you can do it! and im excited ill be there to see you conquer it. Good luck with your training. Now that I've found your blog I will enjoy following along with you. Definitely one of the keys for qualifying for Boston is picking the right race, and climbing mountains generally are not a quality of such a race. Good luck Jen! That sounds like a great goal and one that I am confident you can achieve!